PL09 allows to classify user-defined fields containing personal data as “Sensitive Personal”. Please note this only applies to user-defined fields of the type “Alphanumeric“ with the structure “Text“. To classify a field as “Sensitive Personal“, you first have to add it under Administration > Utilities > Data Protection Tools > Personal Data Management. In a new line, enter the data type and the data sub type and select the user-defined field. Then select “Sensitive Personal“ in the field “Data Classification“. So far, manual distribution rules were not exported. This functionality is now provided with PL09. So far, the field for the DATEV identifier in the tax definition had 3 digits, now it has 4. Moreover, in the tax definition, DATEV identifiers with 3 or 4 digits were not exported as “BU Key”. So far, the EU VAT-ID was not exported if the business partner did not have a Ship To address. 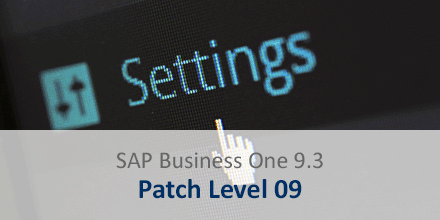 Now SAP Business One uses the EU VAT-ID from the business partner header. So far, the “DATEV Format Version“ was not exported. Now you can enter the “DATEV Format Version“ in the DATEV Format Export under “DATEV Master Data“. Default is “510“. Until now, changed values were not taken into account here.